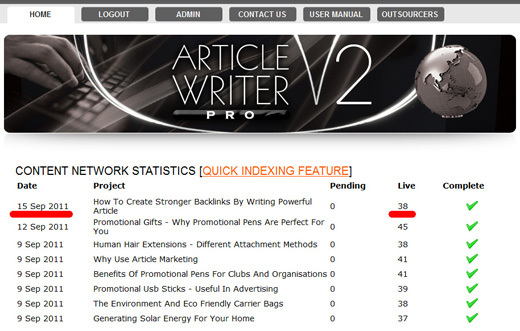 Those of you who are on my mailing list will be aware that I have recently opened up my latest link building / article creation system, Article Writer Pro v2.0. I decided to run a quick case study to test the effeciveness of the network. It is of course early days and I’m currently in the process of adding more sites (PR3 – PR4) but I wanted to see if I could see some benefits from using the system to build links and then show the results to you. As many of you will know, I haven’t posted on my blog in a long time so I decided to pick one of my existing blog posts that I made last year and then find out where I ranked with that post for a specific keyword. 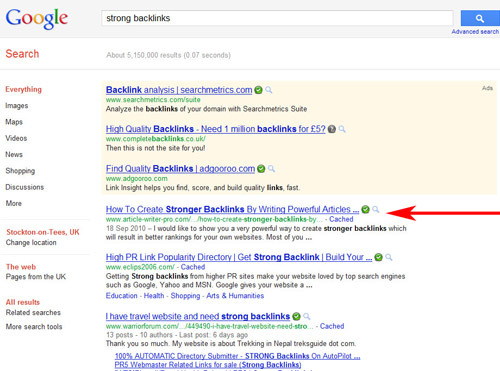 The keyword I chose was strong backlinks. I found that I ranked at no.7 for that keyword phrase (without quotes). I then copied part of my blog post and pasted it into Article Writer Pro v2.0. I parsed the content and rewritten it, by adding 3 new variations for each sentence. I didn’t inluce the original sentnences so I ended up with the equivalent of 3 new versions of my blog post. This took me about 40 minutes to do. I then used the built in title spinner to spin the existing title. This took me about 2 minutes. Finally, I added 3 resource boxes, with each box only containing ONE backlink that pointed back to my blog post. I used a different variation of the anchor text for each of the 3 resource boxes. 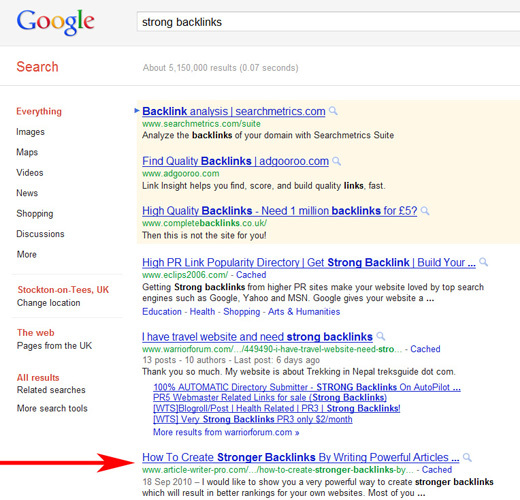 These were ‘strong backlinks’, ‘create strong backlinks’ and ‘build strong backlinks’. 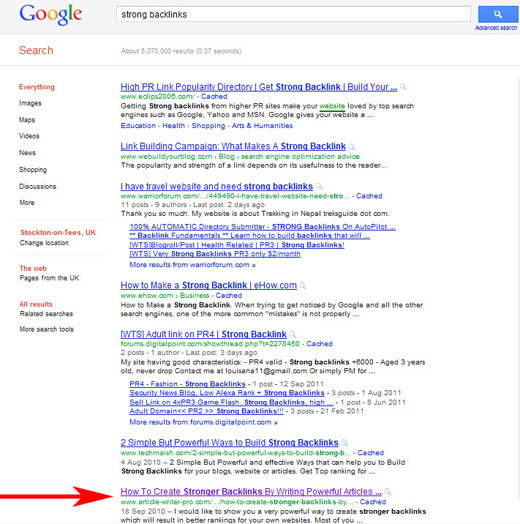 Notice that the words ‘strong backlinks’ are present in ALL three anchor text links. I then chose a category from the drop down list which was ‘Internet Marketing’ and clicked on the ‘Distribute to Network’ button. That’s it. Over the next 4 days the system drip fed these articles throughout the network resulting in 38 versions on my blog post being published on 38 different sites within the network on different IP address.. all containing one backlink pointing back to my original blog post. UPDATED: NOW RANKED 1st PLACE ON GOOGLE! The original blog post was posted ‘ironically’ a year ago yesterday and has been placed solidly in the search results since. The only backlinks being built to this post… certainly this year have been purely from this one project. Jumping four places might not seem much to some but it shows that this system works (and in such a short time). Members who subscribe to the network can submit as many projects as they like. They can rinse and repeat over and over again, and build links to any site, article, video or web page of their choice (Except for inappopriate content or of an adult nature). What makes this network different from the rest is the fact that the articles are only spun on a sentence level. After testing this theory for over a year, I have seen great results by applying this concept. Every article makes sense and uses an ideal ‘structure’ rather than using ‘synonyms’ that frankly, wouldn’t REALLY be used by someone writing an article from scratch. On top of this we don’t over saturate the network with TOO many articles generated by one project. Why dilute the strength of your backlinks?! Another strong point with this network is the fact that we are continuously building links to ALL the sites within the network. I have a system in place that makes this possible. I believe that a steady but constant stream adds ‘weight’ to these sites and creates a sense of ‘activeness’. Not only with new content but also with backlinks. Very important in my eyes. Too many networks have thousands of blogs that are frankly, set and forget. They don’t have anyone building fresh links to them and they are being populated with spun content that don’t usually read too well. There are other unique benefits to the network but I can’t give these away. At the end of the day, it works. I have noticed a slight issue with the publishing rate. I think that on some days the system is publishing twice, hence the reason why it has only taken 5 days to publish the 38 articles, rather than approx. 8 – 10 days. This will be fixed today! There are ONLY 24 hours left to jump on board and subscribe to the network. I am offering FULL UNLIMITED access for only $10 per month. This WILL be closed tomorrow and that price WILL go up when the system re-opens to new members. If you’re serious about making it online and are wanting to earn a passive income then this is something you really want to grab before it is too late. You can join or watch the demo video HERE. This is a nice and working system Andy. The results show that your software works. Wishing you success in this and your other ventures. Thank you. Please note though that the example I have shown above isn’t by any means the most competitive keywords to target. I just wanted to show some results in a short period of time. For more competitive keywords it would be advisable to create multiple projects and submit them to the network to create an ongoing stream of incoming links. This will help to push up your rankings and ovetake your competitors. However, another great use for this system would be to create a blog post on your blog, which targets specific keywords. Then rewrite the post in Article Writer Pro v2.0 and then distribute 35 – 60 articles throughout the network which will result in multiple backlinks pointing back to your blog post. You could choose to do this with every blog post you add. This would result in lots of inner page links which would also help you to improve your ranking for your sites ‘main’ keywords. The ways in which it can be applied is endless. What a great way to show the power of your system, Andy. Thanks for doing this and then sharing it with us. Can the links in the articles only go at the end in a resource box or can they be embedded in the article? Hi Lisa, at present it is only via a resource box BUT I will look at implementing this in some way. Thanks for posting Andy! I’ve had an article ready to go, just have to get my resource boxes done and post to the directory so I’m excited to see what happens! hey andy, just saw this and want to know what time tomorrow will you be closing this? Hi, it’ll be closing around 4pm GMT.